Hotel d’Iéna where the YMCA sheltered Canadian troops awaiting discharge papers after WWI. 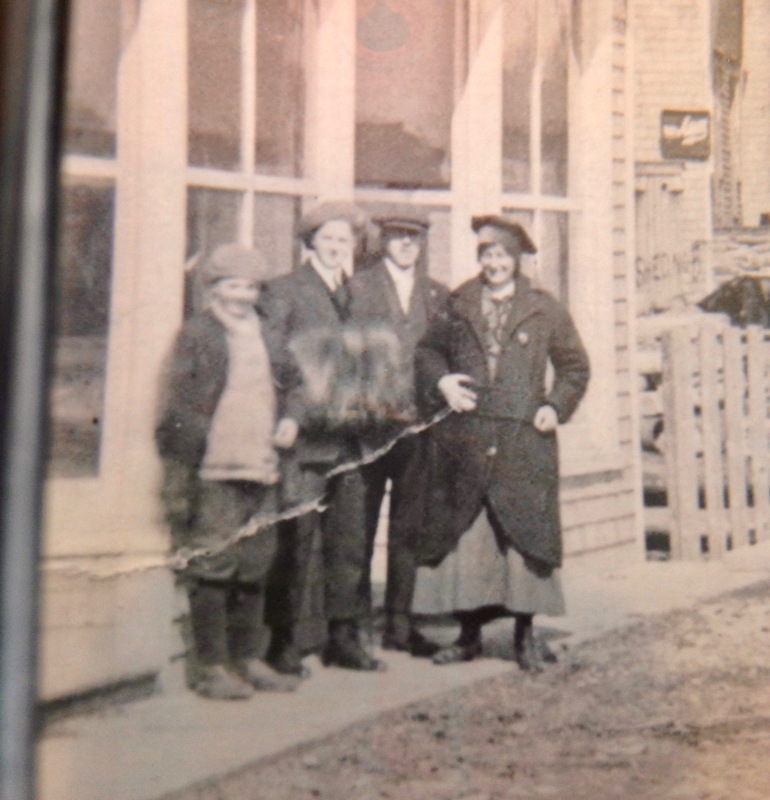 My friend, Eleanor Morse, found this photograph in a Curiosity Shop in Parsonfield, Maine. The framed photo hung on the wall before my desk as I was writing, A Generation of Leaves, the book that was to become the springboard for the play Le Retour which will be performed this summer in Nova Scotia and, hopefully, in Belgium next year as part of events marking the conclusion of the Centenary commemoration of WWI. Often, especially as I was reaching the ending of A Generation of Leaves and my spirits would flag, I would look up at the silent faces of those men, those ghostly apparitions from the past, those men who made it through the war to end all wars. They were going home and that was another story. They were going back to mothers and fathers and sisters and brothers, to wives, to children, to lovers and maybe to no one in particular. But back, hopefully, to work, to fields or oceans, maybe to school, to life. But what did they carry within them, what stories, what visions. Look deeply into any of those faces and try to imagine. It shouldn’t be hard. Certainly we’ve had the practice having had so many wars since the one to end them all. April is the cruellest month, breeding /Lilacs out of the dead land/mixing memory and desire……..I am copying this from my college literature text Modern Verse in English 1900-1950 edited by David Cecil and Alan Tate. My hardback copy of 688 pages was $3.85 in 1960 complete with my erudite marginalia referencing T.S. Eliot’s The Waste Land. I found the poem as dreary then as I find it dreary and self-absorbed now, riddled with obscure references and sly nods to contemporary speech. I don’t think I received a stellar grade in that course. But, often a poet is redeemed for me by a memorable line and I think Eliot’s mixing memory and desire touched such a nerve. Six years ago when I went to the WWI battlefields surrounding Ypres in Belgium, I woke to a misty morning outside the city of Ieper (the reclaimed Flemish name of the city). Looking out the window, I saw only green grass and mist and heard birdsong. This was the city where my young Uncle was somewhere buried in an unknown spot. This was the family story, the family memory and, for me, now, the desire to tell that story. That urge in itself is one of the oldest stories. Why we can’t forget. Why we want to construct memory out of the rag tags of history. So, I visited the trenches. I walked through a few, startled that my shoulders went to the lip of the trench. In 1914, they would have been fortified at the top with sandbags and soldiers were smaller then. I heard the skirl of bagpipes played by a man pacing in Sanctuary Wood where many Canadian forces had lost their lives. I walked through many sun-splashed graveyards where Commonwealth graves are impeccably kept. I saw one German gravesite that my guide took me to and wondered how shaded, dark and somber it was, wondered if that were some kind of retribution for their part in the war and was told no, the Germans wanted it that way. They felt their fallen would like to be in a shaded spot that reminded them of the sheltering, black forests. My guide pointed out, “There, there was this spot for that attack and that spot for the counter-attack”. This high ground, that low ground. I saw fields of green and heard birdsong and felt a soft breeze. Memory and Desire. In 2018, the Commemorations of World War One, the Great War to End All Wars, will conclude. Our little theater group from Nova Scotia will travel to Belgium to present our play Le Retour. We will walk on the earth that holds the bones of our relatives. There will be green grass and mist and birdsong mixed with memory. What will our desire be then? I am reminded of another poet, Carl Sandburg, whose poem Grass references the battles of Waterloo and Austerlitz, Gettysburg, Ypres, and Verdun. Pile the bodies high, the poet says/I am the grass. Let me work. Today on April 10th, 2017– Can we do better than letting the grass cover what we have undone? Works of literature attempt a twining of lives observed, heard, felt and then joined through leaps of imagination. Le Retour, the play to be performed this summer in Nova Scotia, is no exception.When I first began writing the play, I knew it would be the story of two brothers, one who came home to his village from WWI and one who did not come home. But, how that would shake out, the words that would be spoken, the actions taken, the twists and turns of plot unfolding often came as a surprise. The solemn face of the young boy appearing above sitting between two other boys is that of my Uncle Felix who becomes Elzéar in the play, the brother who came home. He sits between Henry Amirault and Louis Leblanc in this photo taken around 1912 in front of the Middle East Pubnico School. In December of 1915, he will sign up with the Canadian Expeditionary Force. He will be 17 years old. He will disembark in England, July 1916. His older brother, Léo, had already left for France and Belgium by November 1915 and was reported missing then killed in action by June 1916. Those were the facts recorded bloodlessly in official documents. The spidery handwriting revealing only dates of embarkation and destination: In Léo case it was Embarkation for France, Reported missing/ After action between 2nd to 5th June, 1916. Now killed in action/Field.” The trajectory of life in the trenches. I wanted my play to fill in the gaps of those pitiful notations. For that, I wrote a book and researched the war. For that, I wrote a play so that living,breathing actors could fill their lungs and live the parts of those two young men, say the words that “officialdom” could never say. There is one story embedded in Le Retour that Felix told his oldest son, Francis “Pierre” d’Entremont who died earlier this year, that is dramatized in the play. It is told in an exchange between two characters. I won’t reveal the story now. You’ll need to come and see the play. But the next story is one I will share. It is not in the play but George David d’Entremont, the son from Felix’s second marriage, told me it last night on the phone. It was one his father had told him when he was a boy. Felix, hardly more than a teenager himself, was on sentry duty in France. One night, a German Officer appeared out of the dark approaching from behind, startling him. There were initial moments of fear but it soon became apparent that the soldier was not threatening, but trying to explain something in German and Felix was responding in English. At some point, they both realized that they both spoke French and the details of surrender were worked out. The German relinquished his sidearm and Felix prepared to walk him back to the authorities. But before he did that, knowing, once in custody, the soldier might be mistreated, Felix took the man’s valuables: his watch, ring , some photos and pinned them for safety under the lapels of the German’s greatcoat so they wouldn’t be taken before turning him over to the Allied position. A moment of decency in that fratricidal war between brothers and cousins who more often than not shared at least one common language between them as well as common borders. We plan in June of 2018 to bring Le Retour to Ieper, Belgium, the Salient where so many Commonwealth and German soldiers lost their lives. The dialogue in Le Retour is written in le français acadien and English and while in Flanders it will be translated also into Dutch, the translation then projected onto a screen to the side of the stage. This was at the request of our hosts in Belgium. It would be wonderful if the play could be translated into many languages. It’s intent is a universal tongue. To begin, what do I know about my Uncle Léo? He was born November 17th, 1893. At 22, he enlisted in the Royal Canadian Regiment, August 21, 1915. He disembarked, November 1915 in Boulogne. He was reported missing then killed in action, Belgium,Ypres, June 5th, 1916. He was 23 years old. Between the arc of those two events, he had his life on this earth. What else do I know? When he enlisted with the Over-Seas Canadian Expeditionary Force at 22, he put down his trade as Grocer. He was not married. He was described by the examiner as being five feet ten, his chest girth when fully expanded was 37 and 1/2 inches, for distinctive marks he bore a large, circular scar on right leg, his complexion dark, his hair black, his eyes blue grey, his religion, Roman Catholic. What is not reported is that he was the eldest in a family of 11 children. He lived in the small, Acadian fishing village of Pubnico on the south shore of Nova Scotia. He had attended the College Sainté-Anne (now the Université Sainte-Anne) for two years. He was a good student. The one photo I have of him shows him with friends in Meteghan. According to Celestine, writing on the back of the photo, The boy next to me is Leanor, next is Léo d’Entremont,”Ain’t he cute?” He’s got my muff. Next is le petit Robert. My ghostly Uncle Léo. And why do I care? Many reasons, one being that I am probably the last generation who will remember, even at this remove, a relative who died in the Great War, as we anglais refer to it, and, also, because I’ve spent most of my adult life, up to and including this year of 2017, resisting war. I am drawn to its human story. What it does to families. How we look for and try to find the missing. How we grieve for those who do not come home and for those who do come home. How we calculate what is gained and what is lost. Le Retour as well as its predecessor, A Generation of Leaves, wrestles with these questions. It has been two years since I entered any notation into this Blog. However, I wish to use it now to chronicle the evolution of my book, A Generation of Leaves, into the play, Le Retour, which will be presented this summer (July 2017) at two venues in Nova Scotia, Canada. The play will be performed at Le Village Historique Acadien de la Nouvelle-Écosse https://levillage.novascotia.ca/visit-us and Le Père Maurice-Le Blanc Theatre in Tusket, Nova Scotia. At this point, we are also launching our funding efforts to bring the play to Ieper, Belgium as part of concluding WWI commemorative events in Europe. Our official promotion of these productions was recently announced in the Yarmouth Vanguard. The news article includes our promotional video shot on location at Le Village. Please check it out. My own efforts regarding this project began in 2014 with the dramatization of the first part of the book presented on the Le Village amphitheater stage. 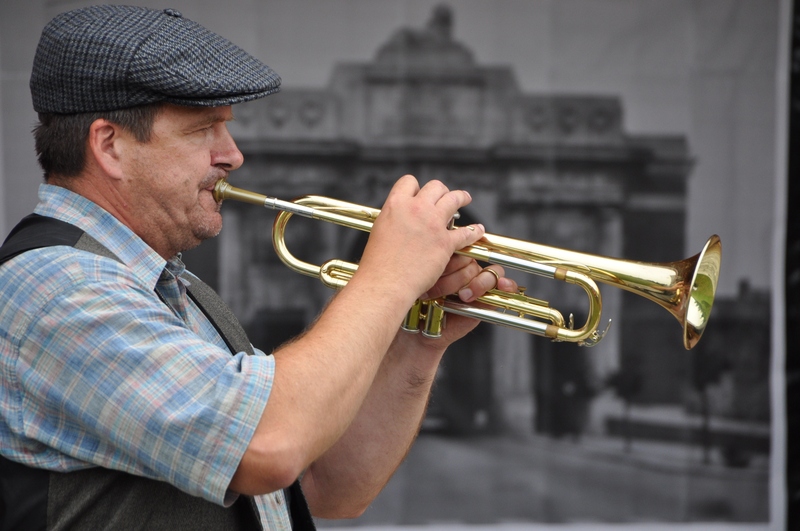 That production concluded with a haunting trumpet solo before a replica of the Menin Gate in Ieper, Belgium. In the WWI literature, Ieper, is referred to as Ypres. Now the city bears its Flemish name. The Menin Gate is legendary in the First World War and engraved on its panels are the names of nearly 55,000 Commonwealth soldiers who died in defense of the city and whose bodies were never found. My Uncle Léo’s name is on the gate. He was 23 when he was killed in the Battle of Mont Sorrel along with many Canadians who perished while defending the city. I want to use these pages to document our progress both while performing the play this summer and our efforts to travel to Belgium in 2018. My next posting will include information about the cast and characters involved in Le Retour. November 2015 marked the 50th anniversary of two crucial events that sparked the book City of Belief: the draft card burning held in Union Square in New York City on November 6th, 1965 and the immolation of Roger La Porte on November 9th, 1965 in front of the United Nations. Both of these events changed my life and the lives of my friends. Both of these events were remembered in New York City last month at the Catholic Worker’s Maryhouse: one event reflected on the draft card burning and the other event was a vesper service for Roger La Porte. Those of us who had been directly touched by those days are now in our late sixties or seventies, some in their eighties. But others at those remembrances were younger yet they too have been and are being touched by the laundry list of wars our country has been involved in since the war in Vietnam. It would be fruitless to go into a debate about the war in Vietnam at this remove, but it shouldn’t be fruitless to reflect on what we did then with our young lives and what we are currently doing now unless you think personal reflection gets you no where–a posture that gets everyone off the hook. And what today is our country’s call? We might have a hard time answering that question. But, in January 1961, we listened on a cold, windy day in Washington, D.C. to a young, Irish-Catholic President take the Oath of Office who challenged us not to ask what our country could do for us, but what we could do for our country. Can you imagine any political figure today daring to pose such a question? It might be time to ask ourselves why and after we’ve answered that question to our satisfaction… Ask why again.